well i just got my new to me fordson major home. the numbers on the block and the plate on the battery tray say its D28A and 1429721. well its getting water in the oil, so im going to assume it needs sleeves and maybe a bit of help around the o-ring grooves as i read they are quite common on this motor. well i started with taking the head off as it was loose from the previous owner haveing it diagnosed about 7 years ago, and i started to pull the oil sump. well it appears as though the bolt of pin that connects the A shaped peice that goes from the front axle to the sump is missing. it lookes like a pin should go through and then a bolt to retain it? does any one know a part number or even what it is called? and maybe a picture or 2 of how it should look? i have access to a full machine shop at work so i would make the part if possible but if not i will buy. but as i live in ontario canada shipping on parts from england get pricey quick. You have a May 1957 New Major with the Mark II engine. Well equipt with the loader. Do you have the bucket also? well i pulled the oil sump this morning, and couldnt see much of anything. so i decided to pour water into the block with the head removed, and as expected i get lots of water dripping out from around the sleeves. now i guess i may be confused but i amagined i would be able to see the bad spots if the oring grooves were rotted away. however i cant. so now i assume that they deteriate from the inside of the water jacket to the o ring grove. would that be correct. so i guess now i need to actually remove the liners to know how bad it is. there is all the pics and some info i have on the tractor. Can't help you with an answer on that. But I'm sure others readers will. Is your tractor upside down or the wheatsheafbadge? ok well i did a bunch of work this weekend. so i have a bunch of questions. so me and the father in law were trying to figure out how to shift from low to high. also i noticed a lever i am not sure on what it is for. 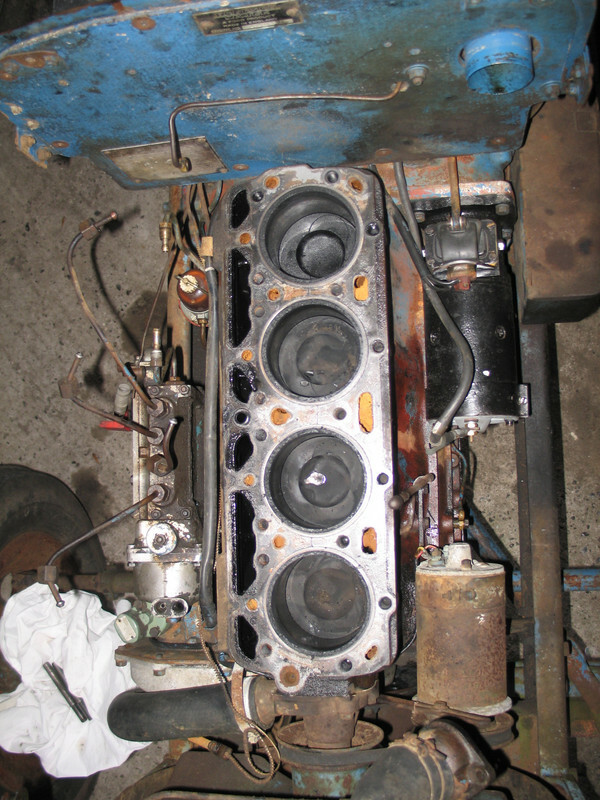 im hoping to get to clean the block as it has had a stop leak product in it... and start prepping for new parts.i am going to go with a full rebuild. any thoughs on the ebay kits? and how is the best way to break the motor in? i dont actually own a farm and want it more for the joy of it and for moving stuff around so i have no way of actually working the motor. i have heard of driving it up to a tree and having it against it to work it. any other thoughts? driving on the road? loader work? Markr1001, hat lever is to enable the pto. And if you want to shift from high to low that lever is right under the throttle lever. Matt85 wrote: Markr1001, hat lever is to enable the pto. And if you want to shift from high to low that lever is right under the throttle lever. weird it doesnt change anything with pto when its in either position? how does it work? and i dont have a lever under my throttle? does any one know where i can get the linkage to connect the next 2 pictures and what does it do? also what is this? it came in a box i got with the tractor. i hope im not asking to many questions. im pretty eager to get the old girl running. Markr1001, You have to pull it towards you to engage the pto. Nothing will happen if the tractor isn't running. Btw if you have a non live major the pto will only spin when the clutch is in. The lever right next to the igintion switch is the high-low shifter. Non-live ptos like mine low is up and high is down. And with live pto it's reversed. That linkage controls the throttle valve in the intake manifold. It's part of the fuel injection system. Hopefully everything I said is right. Anybody reading this feel free to correct me if I'm wrong. Can't seem to place this part on a major!!! Don't worry about the questions - we love em And we're eager to see her running too.. I suspect that when you're pulling the lever, the splines inside the pto drive aren't engaging - try turning the pto stub a little, by hand, and see if the lever can be moved further back? The arms on the back of the tractor are lifted by a hydraulic pump which is driven by the pto, inside the back-end. So if you disengage the pto, you also disengage the lift. If I remember right you have a separate pump on the front of the engine for your loader, completely independent of the transmission. As Bob says, the cracks between the cylinders are not an issue. The structural integrity of the block is not compromised - the head when bolted down holds everything together. Neither is coolant leakage an issue - the head gasket seals the cracks. I discovered the same thing on my 1954 Diesel Major (see photo). After a rebuild the engine ran beautifully, and I worked it hard, as you should. Glad you're rebuilding the engine. It was the only option. The tractor will be a real asset when you've completed the job. So yoyr saaying dont even weld it just leave it as it is and put new liners in and run with it? I have described what I did, and I have described the end result. It's your tractor. You decide! And after a closer look at your pic yours was all 3.... ive emailed a company that sells agriline to see about shipping. I did some more cleaning today and all the oring groves look great! ok so im starting to compile a list of both parts i need to get as well as things i need to do. i will post both lists up later in the weekend once i am sure i have everything i can think of. has anyone ever ordered stuff from http://www.acornservicestractorparts.co ... jor-1.html ? they seem to have a pretty complete engine kit for not a bad price. also does anyone have a part number for a thermostat that i might be able to purchase locally? i found what i beleive to be part numbers for fuel and oil filters that cross over to wix numbers on a napa usa site. im trying to find as much as i can local to save on both shipping and import fees. well i got out the the garage for a short time after work and then again when i woke up. i have a few more questions id love some answers to. then i was looking at my dash and i am missing the indicator light, so i was wondering if anyone can explain how to wire that in as its not in the diagram, as well as i have a toggle switch beside it and it isn't on the wiring diagram either and mine just goes to wires that have no connections, but i do plan on rewiring this once i get it running and i am likely going to order a new key/light switch when i order my rebuild kit. next i cleaned the lift pump bowl ( ashes and water) and it came out quite clean, i am going to pull the tank and rinse it hopefully this week and then see if the lift pump works, if it doesn't i will order a rebuild kit for it as well. then i heard about injector pumps sticking so i opened mine up and it was in fact seized up but i got it freed up and the excess fuel button moving. there was a bunch up mud in my pump but i'm hoping to rinse it out. is there a drain plug? also where do you fill oil to? i've been searching and cant find this info. also im not sure if you can see but the brass bushing on the left side is missing and causing a bit of play in the shaft. is this hard to replace? sorry if i seem like i am jumping around a lot. i'm pretty excited about this project and sometimes only have a little time each day to work on it. here is a list i made of what i plan to do before starting her up as well as parts i need to get, any suggestions on things that need to be added to either list? A long list. Take your time for it. Check you fuel tank on leakage under the soldered caps on te inside where the mounting nuts are. These are soft soldered and when it leaks deu to vibrations and heat, water underneet the diesel will go in it and when it's freezing they crack and you end up with a leaking fuel tank. About the fuelpump. Two warnings. I you don't have knowless about it leave it to a specialist. I costs a lot but then it will be allricht. If you work on it yourself theres no garanties it will work propperly. Be very carefull with diesel under pressure. It can kill you. If you work on it like you are now, be sure to work in a clean enviorment. The rack seems to move nice and free. If the problem only is the left bush, remove the cold start unit on the left side. I think you can remove the bush out that way. Think you have to machine a new bush yourself. What ever you do don't change the holders on the rack. This will set your pump out of system. Maybe cleaning with carburator cleaner is an option. The pump is lubricated by leaking diesel. Don't put oil in it but fill the bottom part up with clean diesel. The pigtail tube is for exces lubrication fuel. Mark, you haven't mentioned the oil pump. Personally, I would fit a new one. You have to assume that the original has been pumping a fair amount of dirty oil over the last sixty years. AdrianNPMajor wrote: Mark, you haven't mentioned the oil pump. I willvadd it to the list... do they offer a rebuild kit? Not possible to rebuild. You'll have to buy a new one.